Apparently, it's cupcake month. Well, according to Food Network and a few others. 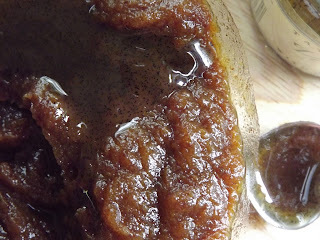 Anyway, I came across a new recipe the other day that I wanted to try, as it involved toffee and caramel. Two of my favourite flavours. But it was the salted caramel that really caught my attention. It's something I've always wanted to try making but have never got around to it. I had a bit of a nudge the other week though. Now, I suspect like anyone else that is interested in baking, I have been hooked to the latest series of Great British Bake Off, currently on BBC2. It's hard not to sympathise with the contestants when they are put through their paces on one of the technical challenges, or are under the pressure of having to produce a showstopping bake against the clock in an unfamiliar oven. Last week's episode had them making cremé caramels for the technical challenge, and there was much angst over saucepans of boiling sugar and water. So, idiot that I am, I decided I wanted to give caramel another go. (The only other time I have made caramel - and that was hard sugar - was for the crown on my Jubilee Royal Velvet Cake). The recipe I had found was by Fiona Cairns for her Sticky Toffee Cupcakes with Salted Caramel Buttercream from her book, Bake and Decorate (you can also find the recipe online here). It seems that I'm a bit late to this particular party, as there are also some great blogging posts detailing it, including this one by Ros at the More Than Occasional Baker from a couple of years ago. But still. I wanted to give it a go. I scaled it down a bit though, and decided to try a way of making a smooth date pureé for the sponge. So here's what I did. Preheat the oven to 165 Fan / 180 conventional / 350 F / Gas 4. Prepare a muffin tin with cupcake liners. Place the dates in a heatproof bowl and pour over 90ml of boiling water. Leave for 10 minutes or so to soak and soften. Mash the dates with a fork and then, to get a smooth pureé, pass the mash through a sieve (this fishes out all the little bits of tough skin, which while I love dates, don't particularly like getting caught in my teeth). Add the vanilla bean paste (or you could just use extract in the same quantity). Mix well and then set aside. Cream the butter and sugar until really light and fluffy (this took me around 5 minutes in my stand mixer using the paddle attachment). Add the egg and mix (it may start to look curdled - don't worry as when you add the flour and bicarbonate of soda - next - it'll come back together). Once the flour and bicarbonate of soda has been added, and mixed in, then add the date puree and mix until just incorporated. This gives a lovely, toffee coloured cake batter. Scoop the mixture into your prepared cases and bake in the centre of the oven for about 18 - 20 minutes until risen and a cocktail stick inserted into the centre comes out clean. Leave to cool in the tin for a few minutes, then turn out onto a wire rack to cool completely. Seriously, don't take any chances and keep a bowl of ice cold water ready so you can plunge your finger / hand in in the event of any untoward sugar incident. Once it is mixed, you should hopefully have a smooth caramel sauce. Leave it to cool. It will thicken as it does, but you want it cool so it doesn't melt the buttercream. To make the buttercream, cream the butter in the bowl of a stand mixer with the icing sugar for at least five minutes (this'll make sure ot is smooth, light and fluffy). I didn't bother sifting my icing sugar as I didn't find it necessary. Add the caramel and beat well until it is fully incorporated. Try not to lick too much out of the bowl (I failed miserably at that). Pipe or spread the buttercream on the top of the cakes. These were really delicious. The toffee sponge is fairly subtle compared to the punch of the caramel buttercream, but they do go well together. The sponge was light and fluffy. The one comment Mike made - as he was busy scarfing one down - was that as he loves sticky toffee pudding, which has a sauce to accompany the sponge, he had expected something a bit more like that. So, next time I make them, I'm going to try making some more caramel - and of a slightly runnier consistency - so that I can put some in the centre of the cakes (like the lemon curd in my Lemon Meringue Cupcakes). Anyway, I definitely love the whole salted caramel thingy - it really appealed to my sweet/savoury side. And making the caramel was an easy - if wary - experience. 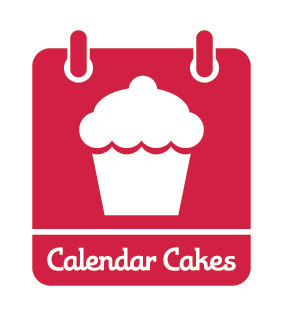 As it is also Cupcake Month on Calendar Cakes, I'm going to submit them to the challenge hosted by Laura of Laura Loves Cakes and Rachel of Dolly Bakes. This month's host is Laura so the round up should appear on her blog around the end of the month. These look amazing!!! Gorgeous frosting and piping :)Thanks for the mention too - I remember making these and crying over the caramel. It was a great recipe and received excellent feedback from everyone. I tried filling a cupcake with caramel but once it sets, its rock hard and you have to warn people that they could break their teeth biting into it! If you know how to keep it liquid, do let me know as I would love to add it as a filling to these cupcakes! These look absolutely delicious! I love the photo of the un-iced cupcake too, so beautifully risen. I've made the hummingbird bakery sticky toffee cupcakes a couple of times, with great success, but it used tinned dulce de leche in the icing. I'm sure a homemade caramel would taste far better though. These look amazing - I love mini versions of classics. The icing sounds gorgeous and impossible to resist! Your heart measuring spoons are the cutest! and vanilla bean paste makes me drool it's so good! haha, love the idea of the salted caramel frosting too! I'm a newcomer to salted caramel, I only recently tried it and now can't get enough! I've never made it myself... YET! Really like the idea of runny caramel in the middle, look forward to hearing how you get on!